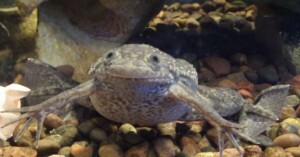 The African Clawed Frog (Xenopus laevis) is also known to tropical fish keeping enthusiasts as the Xenopus, African Clawed Toad, or African Claw Toed frog and is the only amphibian that actually has claws. It is found in Nigeria, and from Sudan to South Africa where they are plentiful in the rivers and ponds within the southeastern portion of Sub Saharan Africa. They are voracious predators that easily adapt to a variety of habitats. Xenopus embryos and eggs are a popular model system for a wide variety of biological and genome sequencing studies. Some cultures also use the frog as a source of protein, an aphrodisiac, or as a fertility medicine. African Clawed Frogs, like all members of the Pipidae family, are toothless, tongueless, scavengers that are totally aquatic. They have three short claws on each of their hind feet which they use to tear apart their food, and unlike their cousins the Dwarf African Frog (Hymenochirus curtipes), they do not have front webbed feet. African Clawed Frogs have no ears; instead they have lateral lines that run down their undersides and the length of their body that allow them to sense vibrations and movements in the water. Like bullfrogs,they have sensitive digits on their front “hands” that they use for eating and detecting food. Every season, African Clawed Frogs shed their skins, which they promptly eat. African Clawed Frogs are a brown to greenish grey in color and have multicolored olive gray or brown blotches on their backs. Their undersides are a creamy white color with a yellowish tinge. Albino specimens are relatively common and demand more attention as aquarium pets. 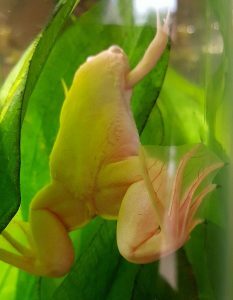 Male African Clawed Frogs are smaller than the females with slimmer bodies and legs, and develop glands that looks like small pink or white bumps behind their front legs. The females are plumper than the males and have a noticeable bulge above their rear legs where their eggs are located internally. Both sexes have a cloaca where their reproductive systems empty, and their digestive and urinary wastes pass. Both sexes are also able to make mating sounds by contracting their laryngeal muscles. The males sound like a cricket calling underwater, while the females produce a slow ticking or rapping sound, that signals acceptance or rejection of the male’s advances. among, and some floating plants to diffuse the lighting in the tank. They need adequate filtration, but avoid a strong current in the tank. These frogs are “escape artists” that need a tightly fitting cover to prevent them from crawling out. Because of their voracious appetite, they are best kept in a single species tank with 4 or 5 others of their own kind. They should not be kept with fish smaller than themselves. African Clawed Frogs lay their eggs during the rainy season from winter through spring. After going through a mating ritual, the male clasps the female in front of the female’s back legs and squeezes her until the eggs come out. The eggs are then fertilized outside her body. In their natural habitat, African Clawed Frogs are voracious scavengers that crawl along the bottom eating organic wastes, small live, dead, or dying fish, tadpoles, worms, crustaceans or just about anything edible that they can fit into their mouths. In an aquarium environment they do best with live, frozen, or freeze dried bloodworms , waxworms, earthworms, tubifex , feeder fish, guppies, brine shrimp, floating reptile sticks, and even dog or cat food. Because African Clawed Frogs are such easily adaptable and voracious predators, they can easily become a harmful invasive species. They are capable of traveling short distances to other bodies of water, and have been known to survive mild freezing conditions. There are documented reports of them virtually wiping out native populations of frogs and fish by eating their fry. *They are commonly available for purchase at reasonable prices when they are about 1-1/2″ or over in size. 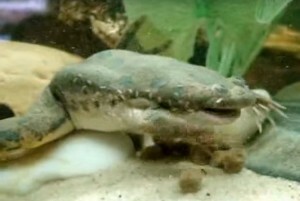 African Clawed Frogs are illegal to own, transport or sell without a permit in Arizona, California, Kentucky, Louisiana, New Jersey, North Carolina, Oregon, Virginia, Hawaii, Nevada, and Washington state.